Thiensville Loop. This route is ridden clockwise or counterclockwise, depending on conditions (wind, time of day, traffic, etc). The direction picked for any given ride is a joint decision between the ride leader and the ride participants. ﻿Monday Night Recovery Ride Route. Depending on time of day and traffic, riders may choose to head north on Santa Monica and get on Lake Drive closer the Schlitz Audubon Center to avoid Lake Drive traffic (as portrayed in the picture. 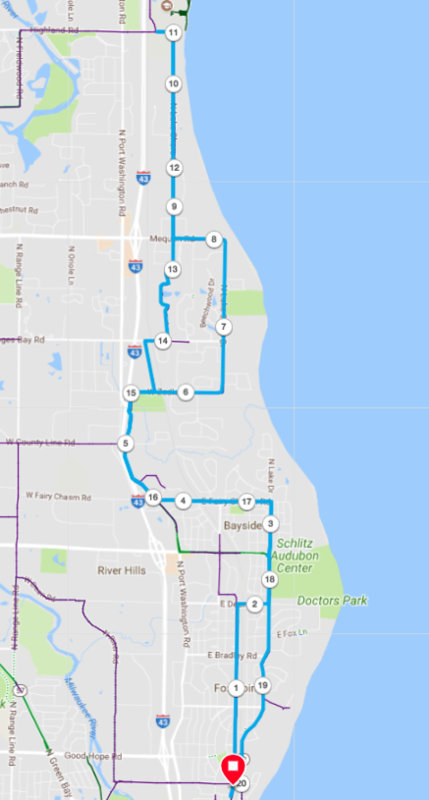 This is a standard route to Port Washington that includes a loop up and around Upper Lake Park. Many riders choose to not do this loop, rather just wait at a local coffee shop (there are many) for the rest of the group to conclude the loop and return to the coffee shop. Below this route picture are three downloadable files; a cue sheet, a GPX file, and a TCX file. The GPX and TCX files can be loaded into devices that support that file type. Please consult your owners manual to see which file type, if any, your particular device supports. Devices that support one of these files will be able to project the route on the device, and in the case of GPX files, provide turn by turn directions. This is just one of many options for riding to/from Holy Hill. Here is another Holy Hill Route. This route takes you west on Freistadt/Hubertus as usual, but when you hit the intersection of St Augustine and Emerald, instead of going left on Emerald, you continue on St. Augustine across Holy Hill Road and go west on Pleasant Hill (for a slightly shorter option with a steep climb, go west on Shannon). Either way, you head south on Hwy K to Hwy 167 (Holy Hill Rd). A left and about a mile along you see the entrance to the Holy Hill National Shrine of Mary. Go right, and follow the road to the upper parking lot. Don't forget to climb all the way to the top and touch the brown door. Return home by going south on Hwy K to County Line Road, then east to Monches. You'll enjoy a beautiful ride along Monches/Scenic. Then a right on Willow and eventually head back to Milwaukee via Donges Bay Road to the bike path.